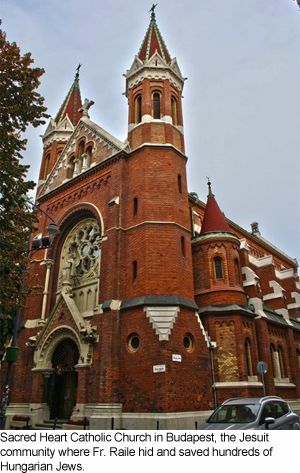 This Monastery, located at 52 Maria Street, Budapest, gave shelter to some 150 Jews during the Holocaust. The same was directed by Father Jacob Raile, who joined the Jesuit order in 1912. Father Raile not only took good care of his own refugees, but he also had a fluent contact with the Swedish Red Cross on behalf of the Apostolic Nuncio and helped coordinating the rescue efforts of the former organization. On more than one occasion, Father Raile risked his own life, standing up against the Arrow Cross gangs, who demanded to enter the monastery. Employing delay tactics, he gave time to the refugees to hide, thus rendering the search with no results. His Monastery served also as shelter for Army deserters and others who fled from the Nazis and their local henchmen. Raile organized these Army deserters in favor of the defense of the Monastery. He also entered the Jewish Ghetto, together with emissaries from the Swedish Red Cross, distributing food, medicines as well as forged baptism documents to the beleaguered Ghetto residents. Amidst heavy bombardments, Father Raile wandered around the city of Budapest, looking for food for the refugees, putting his own life at risk. When the Communists took over, Father Raile immigrated to the United States, where he taught German at Boston College High School. He perished in a road accident in 1949. 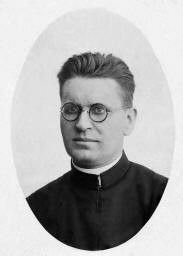 In 1991, Father Raile was officially recognized as Righteous among the Nations. Eduardo Eurnekian and Baruch Tenembaum, Chairman and Founder of the IRWF respectively stated that “The mesmerizing feats of Father Raile show us the power of goodness against the larger forces of evil. His Monastery will be proclaimed as a House of Life, in recognition of his courageous life and legacy. He is role model to the young generations and we owe Father Raile our eternal gratitude”.